Detox! We have all heard about this and many more are trying it out each day. I have done my fair share of close to 15 of them over the last 18 years with my longest being for 1 year. Yep, see we are always detoxifying, so for me to say I was on a detox for a year, it means I was very conscious of supporting my body and enhancing the process to do some serious healing. I would also add, it was the year before I was able to conceive my first child. So, I for one, am a believer in detoxing…. and here is what it’s all about. heavy metals – including lead in lipstick! When toxins are not broken down, due to an overload or poor detoxification, they are stored in fat cells all over our bodies, including the hormone glands, our brain, the lining of our nervous system (Myelin sheath) and fat cells all over our body. Hence we get hormone issues, headaches, irritability and even joint aches and pains. Our body is always detoxing and trying to eliminate these harmful substances and during that process byproducts, known as free radicals are created. If our liver and detoxification processes are not functioning optimally (including having the right nutrients available like anti-oxidants) we are at increased risk of free radical damage – which includes, but not limited to, liver damage, DNA damage, and heart disease. How does our body detox? The liver is the primary detoxification organ. It has hundreds of functions, is super smart and capable of breaking down these toxins into less harmful substances which can then be excreted by our bodies. Everyday we detoxify through the liver, our kidneys, our colon, our skin/sweat, and our lungs/breathing. As long as the toxic load is not too much our body usually is able to detoxify without significant buildup. 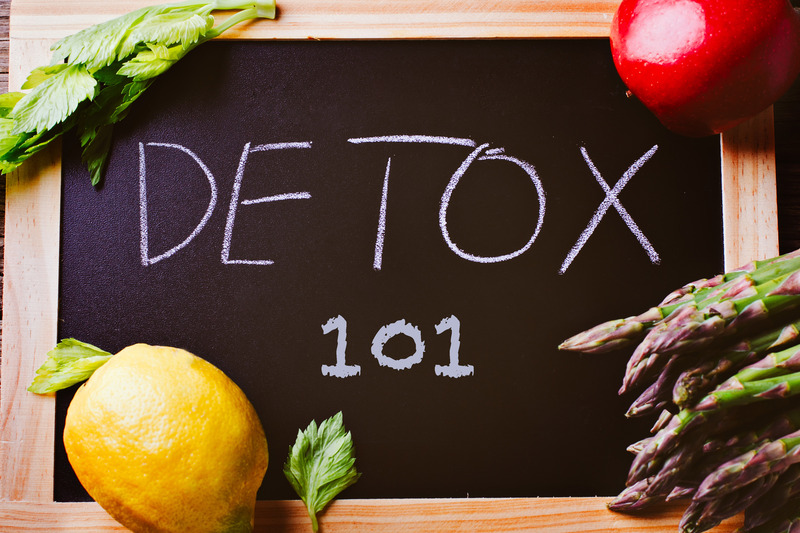 When we detox at night, which we all do our body gets these toxins out but in the short term (when starting a detox) we often get headaches, mood swings, fatigue and aches from the increased elimination underway. The many functions of the liver. Liver detoxification has 2 phases, one that makes toxins less harmful and the second that makes them water soluble to enable elimination. They both need to be working well, especially since the first phase can create free radicals and and overload of byproducts if the second is getting them moving out. Both phases need different support from vitamins and minerals to enable the processes. Here is an overview and what foods are good for both phases. Your body does it everyday and night to stay alive and well – it’s best to support this objective! Our environment is laden with pollutants and chemicals which continue to build up inside of us. Regular spring and fall cleaning is a must to avoid excess harm. Our stress is very high and impacts our liver function daily, along with creating internal toxins of its own. We are not sweating enough or breathing deeply. These are two major pathways of elimination that are just not being used enough. Detox includes boosting this through activity, hot yoga, meditation, etc. Toxins and poor detoxification impacts not only how we feel, chronic diseases but also the aging process – stay young! Because we are all sick and tired of feeling sick and tired. Because you want to know you did your part in staving off disease by taking care of you and your health. The best way to detox is through incorporating the above foods and nutrients, sweating, deep breathing and keeping our toxic load down. Our bodies will magically do the reset if we give it the right nutrients, movement, mindset and environment. If you are hoping to do a complete detox with supplements to address specific health issues, I recommend working with a naturopath or nutritionist who can create a custom protocol. Have you ever done a detox? How did you feel during and after? Share your experiences below!